No, an image won’t pop out if you stare at this picture long enough. 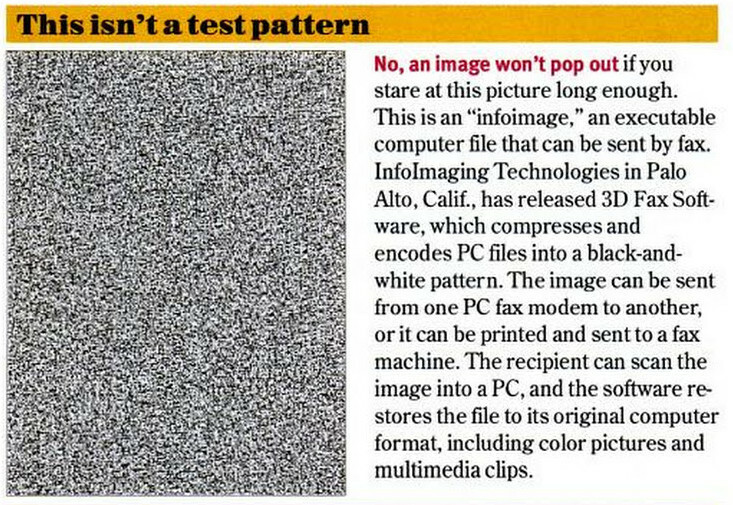 This is an “infoimage,” an executable computer file that can be sent by fax. 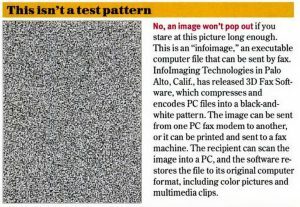 InfoImaging Technologies in Palo Alto, Calif., has released 3D Fax Software, which compresses and encodes PC files into a black-and-white pattern. The image can be sent from one PC fax modem to another, or it can be printed and sent to a fax machine. The recipient can scan the image into a PC, and the software restores the file to its original computer format, including color pictures and multimedia clips.